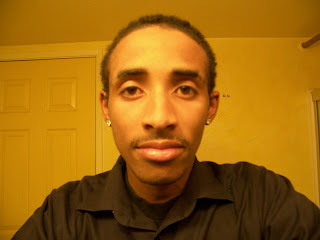 (Bloggers note: Starting next week, you can check in to my blog, Chronicle of Truth every Tuesday for routine updates. The name change from Mind, Matter, Movement to Chronicle of Truth stems from an award I recently received from the Families to Amend California's Three Strikes Law (F.A.C.T.S.). Their consideration really touched me, especially since it came from an organization on the front lines in the struggle for justice but more on the name change later. Thank God! My family and I returned home safely from Saviours’ Day last night and fell into our regular routine, which included picking up my children’s dog from their cousins in Corona (about an hour or so away). So I sit down to post about Saviours’ Day, a fabulous, wonderful, exciting, spiritual, rejuvenating, exhilarating family reunion, and my 18-year-old nephew, Jeremy Vernon walks up and hands me a picture he drew of President Barack Obama. It really drew me in, but the paper he wrote explaining his artwork really did it. 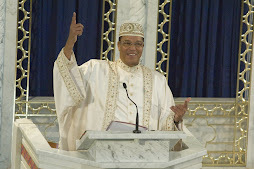 He reminded me so pointedly about the Honorable Minister Louis Farrakhan’s 2008 Saviours’ Day message, “The Gods At War: The Future Is All About Y.O.U.th.” I just have to share it. 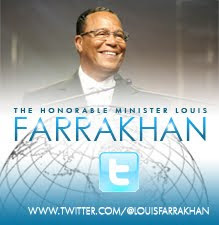 to order the Minister’s powerful message on Accepting Responsibility to Build Our Community; of course get the current edition at your local spot; and treat yourself to Southwest Region Staff Writer Jesse Muhammad’s blog (http://jessemuhammad.blogs.finalcall.com/). He has day-by-day activities posted and he conducted a live blog on Sunday. Until later, here’s Jeremy’s paper, completed for a visual arts assignment on his political interest. 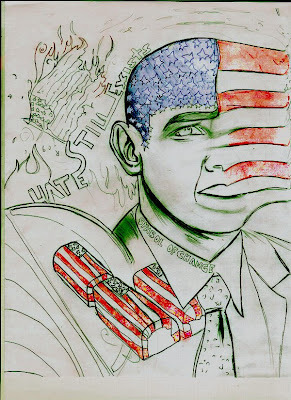 I drew a picture of President Obama as a symbol of change taking place in America. In other countries, our flag is burned as a symbol of the negative feeling towards us. The picture of President Obama shows our strong need for change and his election was meant to usher in that change. What my picture represents is the fact that there are still hate groups in America. There are still people in the world who not only dislike the idea of a Black President; they haven’t accepted the fact that we actually have one. Times have changed yes, not all people are willing to grow with the changes. In their minds, their personal memories and image of America is also burning. My picture basically symbolizes the division in America that is increasingly starting to show again. Since the civil rights period, people have always known that racism and segregation could not remain. We have death threats made against our new President by “God–fearing Americans”, racial jokes and hints posted on emails and in media. It only shows that much change is still needed. Obama’s election by Americans of all races is the change that America desperately wants and needs. Our generation has made that clear. He is not "the" change, our coming together to elect him as President is the change. The other issue my picture addresses our government’s policy regarding the return of military dead to the U.S.
America does not like to see the bad sides of war. There really is no good that comes from war, but refusing to show images of our dead heroes of war only softens the idea of death for everyone but the families who’ve lost loved ones. It hides the truth about war under the disguise of protecting the privacy of families. Although that’s important, what’s more important is to show people what is really happening to our troops. Instead, the lack of these sad photos of our dead heroes returning home by plane in a coffin leaves the image of war as a sort of video game. It’s an honor to choose to go to war to protect our nation, but more than half of young Americans do not even know the reason why we are in the war to begin with. The old saying "The old men send the younger men to fight their wars” describes the time that we live in. The old men of the previous administration sent the nations younger men to do their bidding and fight their battles. The least America deserves is to know what is happening to our men. The coffin in my picture is symbolic of all this. It symbolizes the demand for media to stop hiding the truth of the war from the American people and stop sugar coating the sad results of war. My medium of work was pencil and shading then scanned to a computer for color insert. Wow, Sister Charlene. In addition to food for thought, you have posted some very impressive artwork. All Praises Due to Allah. Thanks for the feed back and encouragement Bro. Askia. It was great to see you and Sis. 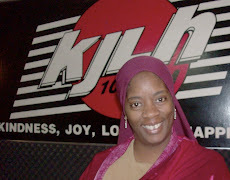 Alverda at Saviours' Day.